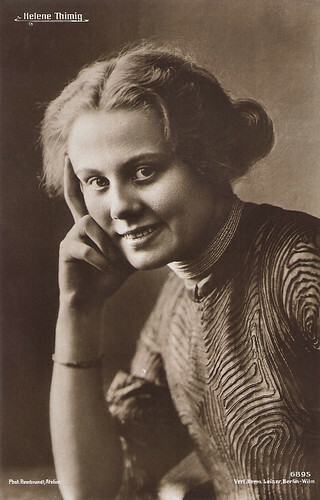 Austrian actress Helene Thimig (1889-1974) was an important stage performer during the Weimar republic. She came from a renown acting family: she was the daughter of Hugo Thimig and the sister of Hermann Thimig and Hans Thimig. She fled the Nazis with her later husband, theatre producer/director Max Reinhardt, sought refuge in Hollywood, and appeared in 18 Hollywood films. After the war, she returned to Vienna where she had a prolific stage career but only sporadically appeared in films. German postcard by Verlag Herm. Leiser, Berlin-Wilm., no. 6895. Photo: Rembrandt Atelier. Helene Ottilie Thimig was born in Wien (Vienna) in 1889. She was the daughter of the later Burgtheater director Hugo Thimig and his wife Franziska née. Hummel. Her two brothers Hermann Thimig and Hans Thimig also became actors. After elementary school and the Lyceum Luithlen she took acting lessons with Hedwig Bleibtreu. 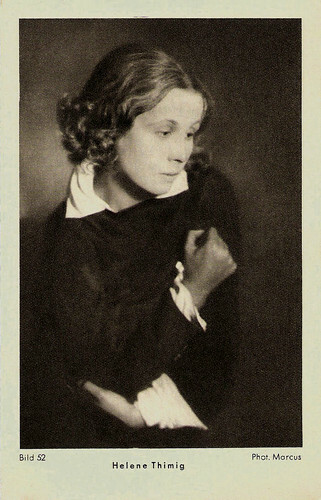 In 1907 she had her first appearance in the Stadttheater of Baden as Marthe in Edouard Pailleron's The Mouse. 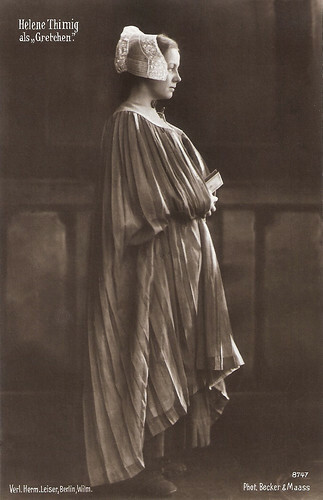 In 1908 she played Melissa in Franz Grillparzer's Sappho at the Goethe Festival in Dusseldorf, then she acted at the Hoftheater (Court Theatre) in Meiningen, and from 1911 to 1917 at the Königlichen Schauspielhaus (Royal Playhouse) in Berlin. 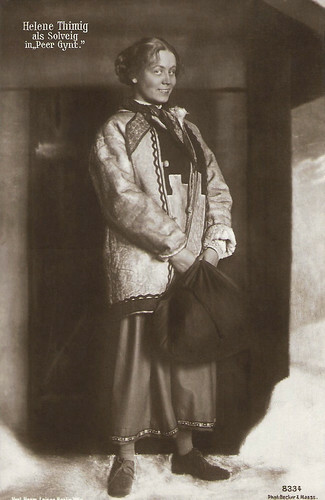 In 1917 she received an engagement at the Deutschen Theater (German Theatre) in Berlin, where she debuted as Elsalil in Gerhart Hauptmann's Winterballade (Winter Ballad). From the beginning, a close cooperation and love affair developed between her and Max Reinhardt, director of the Deutschen Theater. He was married to actress Else Heims and had two sons with her. Thimig was married to the director Paul Kalbeck from 1916 to 1918. She made her film debut in the drama Mensch ohne Namen/Man Without a Name (Gustav Ucicky, 1932) starring Werner Krauss. When Reinhardt was ostracised after the Nazis came to power in 1933, Thimig's successful stage career in Berlin also came to an end. She followed Reinhardt to Vienna and performed at the Theater in der Josefstadt, which Reinhardt directed. Further performances followed in Prague and at the Salzburg Festival. Thimig followed Reinhardt to various productions in several European countries and after his divorce, they were married in Nevada in May 1935 during a guest appearance in the United States. At the end of October 1937 she finally joined Reinhardt in his American exile. Since she learned the English language slowly, she received for a long time only very small roles in American theatre and film productions. Between 1942 and 1947 she appeared in 18 Hollywood films, in which she represented mostly German women. These included The Gay Sisters (Irving Rapper, 1942) starring Barbara Stanwyck, the pseudo-documentary The Hitler Gang (John Farrow, 1944), The Seventh Cross (Fred Zinnemann, 1944), starring Spencer Tracy, and the Film Noir Cloak and Dagger (Fritz Lang, 1946), starring Gary Cooper. In 1943, Max Reinhardt died. German postcard by Margarinewerk Eidelstedt Gebr. Fauser G.m.b.H., Holstein, Serie 1, no. Bild 52. Photo: Marcus. German postcard by Ross Verlag, no. 6970/1, 1931-1932. Photo: Ufa. Publicity still for Mensch ohne Namen/The Man Without a Name (Gustav Ucicky, 1932). After the end of the Second World War, Helene Thimig returned to Europe. She appeared in a few films, including the Austrian film Der Engel mit der Posaune/The Angel with the Trumpet (Karl Hartl, 1948). In Austria she became a member of the Burgtheater, where in 1950 she was awarded the honorary title of a Kammerschauspielerin (chamber actress). In 1948 she entered into a third marriage with the Austrian actor Anton Edthofer. 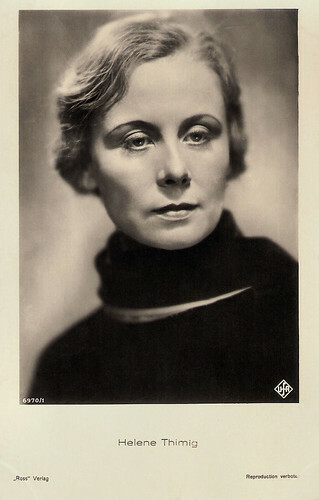 Between 1947 and 1951 she staged Hugo von Hofmannsthal's Jedermann (Everyman) at the Salzburg Festival and directed the Viennese Max Reinhardt Seminar from 1948 to 1954. In addition, she took on a teaching position as a professor at the Academy of Music and Performing Arts. In the cinema, however, she received only a few tasks, including a role in the American production Decision Before Dawn (Anatole Litvak, 1951), starring Richard Basehart and Oskar Werner, and the German drama Waldwinter/Winter in the Woods (Wolfgang Liebeneiner, 1956), starring Claus Holm. After leaving the Burgtheater ensemble in 1954, she again took on a firm commitment at the Theater in der Josefstadt. From 1963 to 1968 she again staged Jedermann at the Salzburg Festival. At the end of March 1974 she was on stage for the last time in Josefstadt. In November 1974, Helene Thimig-Reinhardt died in her native Vienna of heart failure at the age of 85. She was cremated in the crematorium Feuerhalle Simmering and buried in an honorary dedicated urn. In 2015, the urn with her ashes was moved to a grave dedicated to the honour of the Neustift cemetery. In 2016, the Helene-Thimig-Weg was named after her in Vienna Liesing. Thimig received prizes and awards, including the Josef-Kainz-Medaille in 1962 and the Ring of Honour of the City of Vienna in 1969. German postcard by Verlag Herm. Leiser, Berlin-Wilm., no. 8334. Photo: Becker & Maass. Caption: Helen Thimig as Solveig in Peer Gynt. Thimig appeared in the play by Henrik Ibsen in 1914. German postcard by Verlag Herm. Leiser, Berlin-Wilm., no. 8747. Photo: Becker & Maass. Publicity still for Max Reinhardt's stage production of Goethe's Faust (1920) with Helene Thimig as Gretchen. Sources: Wikipedia (German and English) and IMDb.